To kick off the Week of the Young Child, Kids Day will be held on Saturday, April 9, 2016, from 10 a.m. to 2 p.m. at Rosedale Park, 340 Dartmouth, San Antonio, TX. This family-friendly event promises to provide fun and educational activities for children ages 10 and under and will be held rain or shine. WHEN: Saturday, April 9 | 10 a.m. - 2 p.m.
Close to 2,000 people are expected to attend this FREE spring event. Families will have an opportunity to visit numerous informational booths sponsored by schools and child care centers, non-profit organizations, local businesses and city departments. Programs, like KLRN’s Early ON School Readiness, will share with families activity ideas adults can offer to help prepare the children for school success. Agencies will share information on free parent and caregiver workshops; many of these workshops provide families with hands-on learning activities, free materials and books. Kids Day activity booths include face painting, sensory stations, gross motor activities, science exploration, and arts and crafts areas. 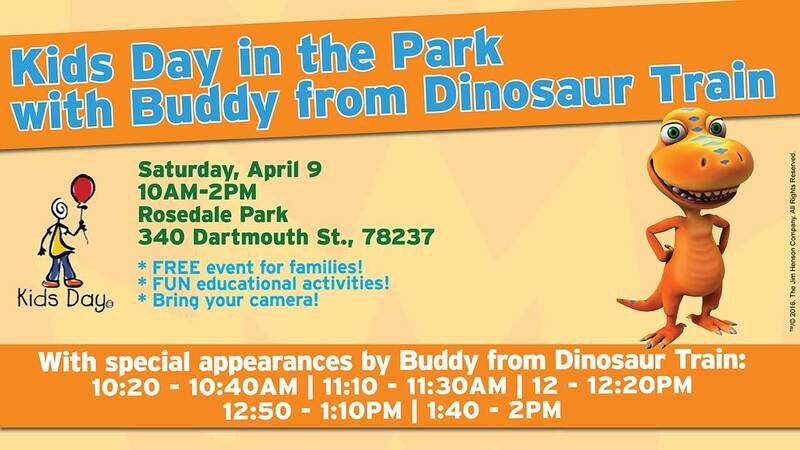 Entertainment will include dancers and musicians on stage throughout the day; mascot characters, including Buddy from Dinosaur Train. Kids Day in the Park is presented by KLRN Public Television, San Antonio Association for the Education of Young Children, and the City of San Antonio. This event is co-sponsored by the San Antonio Parks and Recreation Department, and numerous other organizations and individuals who have contributed time and in-kind donations in order to make this event happen.